From his partnership with Art Garfunkel to 2006's Surprise Paul Simon has seen and done it all, and he's not lost anything in all the years he's been going. In fact the new album from one of the century's most important songwriters displays some of the best work he's put to tape in a long time. And he's done it all with Brian Eno. Excited? I bet you are. Surprise, Paul Simon's new album is great! Is it a surprise that after so many years making Class A music he comes back yet again with another stonker? I'd say it's no surprise, because he's Paul Simon. But this is especially good, and could be his best and most original work since 'Graceland'. With sonic landscaping by Brian Eno (calm yourself, calm yourself) and as much excitement and enthusiasm as has frequented all his best records over the years, plus his indelibly charming voice still in full-swing and guitars woven so well aurally your left gob-smacked this is a real treat for fans, who span generations of music listeners. Opener 'How Can You Live In The Northeast?' is reminiscent of the likes of 'The Only Living Boy In New York', with modern updates both in terms of subject matter (a caustic retort to current events) and musicality (multi-layered guitars working sonically into a typically Simon-esque, acoustically beautiful chorus). There are in fact a number of surprises to be found on here; Herbie Hancock lending piano to the haunting and sweeping 'Wartime Prayers', the near rap of brash and ?er-cool pop song 'Outrageous' and when the electronic drum sounds kick in on 'Everything About It Is A Love Song', elevating the tune to a status at which even the most hardened critic will have no ground on which to base an accusation of it not being a masterpiece. The tunes are generally smooth and chilled out, relaxing whilst maintaining that energetic and wholesome unique edge that Paul Simon has chiselled and made his own over the past forty years or so. And with Eno at the sound-manipulating helm there's such a depth to the audio phonics that you often get lost, only to be brought back by Simon's aptitude for making a pristinely perfect pop melody. In his own words, found in 'Once Upon A Time There Was An Ocean', "nothing is different, but everything's changed." This is still pure classic Paul Simon, but it's new and in tune with the times, whilst standing far enough away from any zeitgeist of now and retaining what's always made this man's song writing special. This is as good as when Pink Floyd came back with The Division Bell. 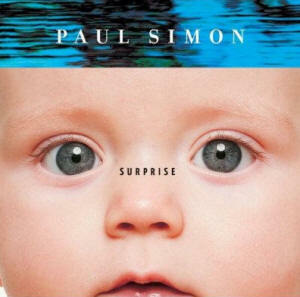 Paul Simon's Surprise is an awesome album that's been approached with tender loving care but sounds effortless, but even after all these years it's no surprise that this is brilliant.